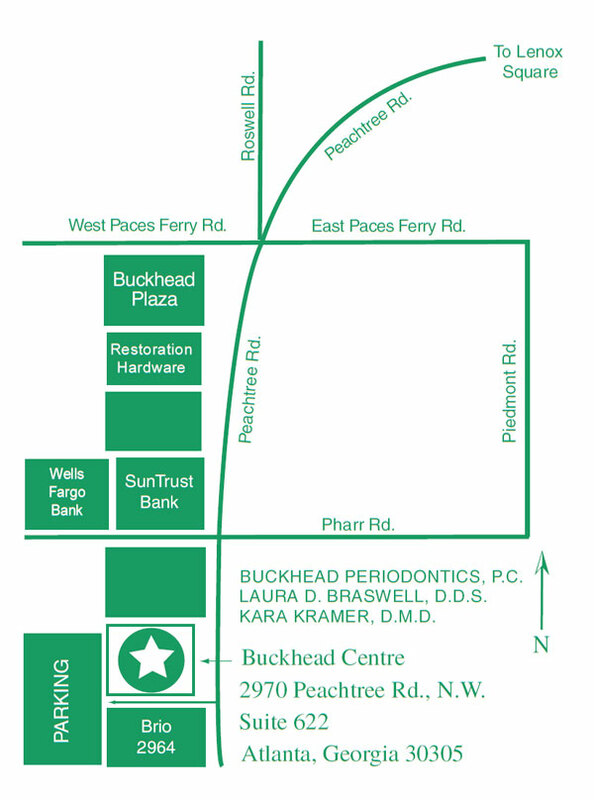 Buckhead Periodontics is in the Buckhead Centre complex, on Peachtree Street in Buckhead just south of the intersection of Peachtree Road and Pharr Road. Free parking is available behind the building. PARKING INFO: Buckhead Centre, the complex Buckhead Periodontics is located in, is implementing a fee for parking at our building. This is a decision made by the current owners of Buckhead Centre. The daily parking rates will be $2.00 for every 30 minutes up to a daily maximum of $12.00 with a lost ticket fee of $12.00. The exit will ONLY accept cards (Visa, Mastercard, Discover, American Express). The only entrance and exit for patients/visitors will be on Peachtree Road NW. It is recommended that if you need to travel north on Peachtree you should turn right out of the parking lot and find a safe and convenient place to turn around instead of attempting to turn left out of the parking lot. Thank you. Exit Buckhead/Lenox Road and follow signs to Peachtree Road South. Turn Right onto Peachtree Road where “Rooms to Go” is on the corner. Continue South for 2 miles. (you’ll see Suntrust Bank on your right). Go through the traffic light at Pharr Rd and Buckhead Centre will be on the right. Exit Lenox Road/Cheshire Bridge and turn left onto Cheshire Bridge Road. At the second traffic light, turn right onto Lindbergh Drive. Continue west on Lindbergh Drive for approximately 1 mile. Turn right onto Piedmont Road. Continue north on Piedmont Road for approximately 1.5 miles. Turn left onto Pharr Road where the BP Gas Station is on the corner. Follow to the third traffic light (Peachtree Road) and made a left. Buckhead Centre will be on the right. Exit Northside Parkway/West Paces Ferry Road. Turn left onto West Paces Ferry Road. Continue east for approximately 3 miles. Turn right onto Peachtree Road (you’ll see Suntrust Bank on your right). Go through the traffic light at Pharr Rd. Buckhead Centre will be on the right. At the 75/85 split, take I-85 North. Exit Buford Highway/Monroe Road/Lenox Road. Follow the exit sign to Piedmont Road north. Merge onto Piedmont Road and continue north for approximately 2 miles. Turn left onto Pharr Road (BP Gas Station on the corner). Follow to the third traffic light (Peachtree Road) and make a left. Buckhead Centre and will be on the right.